This morning Jeff and I had an early tour because of the high temperatures in Central Australia, which are even hot during the Australian winter. We woke up about 3:30 a.m. for our AAT Kings tour that picked us up around 4 a.m. Alison, our guide at Uluru and the Olgas, talked us into joining her tour to Kings Canyon, which cost about $189. We drove through the sand hill country north on our approximate 3.5-hour journey. We stopped for breakfast at Kings Creek Station where we ate breakfast. Upon arrival at Kings Canyon after the 300-kilometer drive, Alison led us on an energetic three-hour tour. 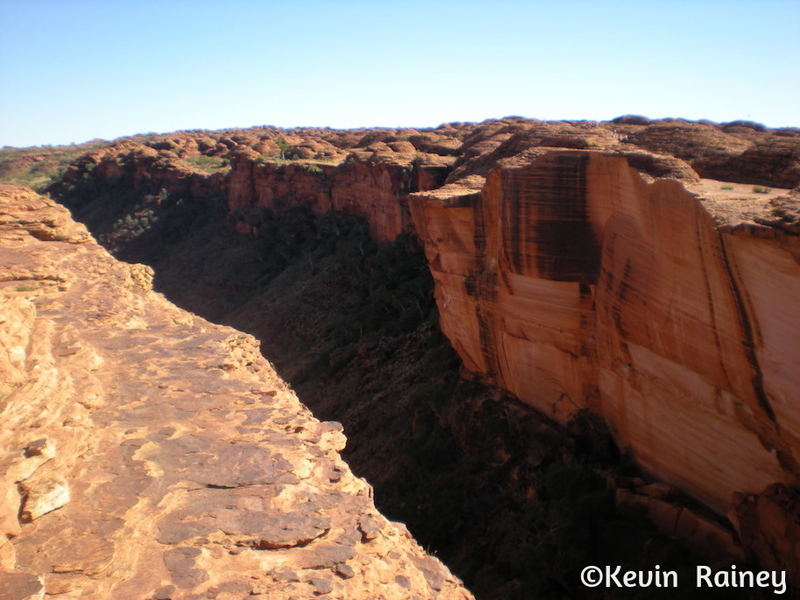 Kings Canyon is part of the Watarrka National Park and sits at the western end of the George Gill Range. The canyon is located about is 190 miles southwest of Alice Springs, and almost halfway between Kings Canyon and Uluru. Kings Creek passes through Kings Canyon, as the massive walls rise more than 300 feet above. Aboriginal tribes consider it sacred, so visitors are discouraged from veering off walking tracks. Alison led us on a loop tour and that took about four hours and included the Kings Canyon Rim Walk at the top of the canyon. We began with a steep climb at the beginning of the walk up “Heartbreak Hill.” At the top we enjoyed spectacular views of the gorge below. About half way during the walk, we descended to the Garden of Eden, a permanent waterhole surrounded by lush plant life. Then we passed through a large maze of weathered sandstone domes. At the end, we descended slowly back to the parking lot as black-breasted buzzards soared overhead! The soaring sandstone walls of Kings Canyon formed when small cracks eroded over millions of years. Derived from an Aboriginal word referring to the umbrella bush that thrives here, the Luritja Aboriginal people have called the Watarrka National Park area home for more than 20,000 years. On the way back, we stopped at the Desert Oaks Café in Wararka for lunch. We had crocodile for lunch and laughed at the hilarious outback jokes and stories that decorated the interior walls. After the 3.5-hour return trip, we arrived back in Uluru. Jeff and explored the resort before decided to do something unique for dinner. 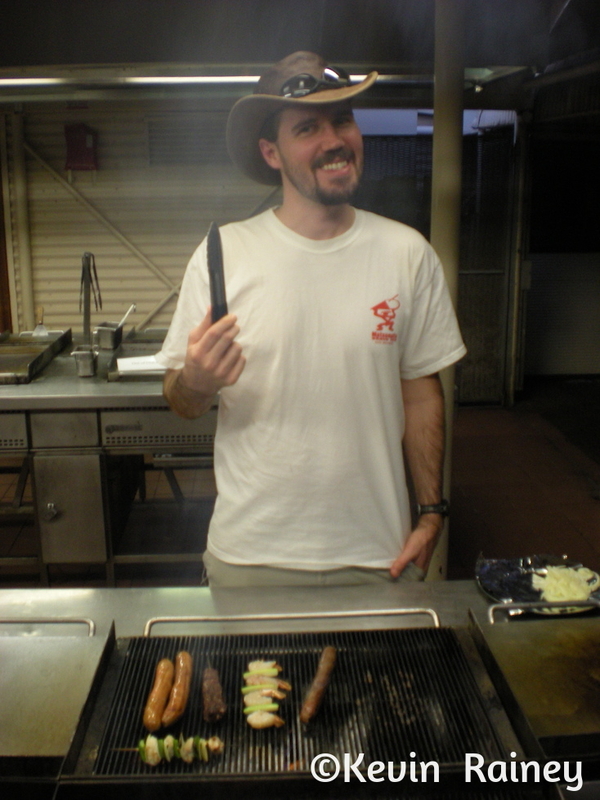 We went to the popular Pioneer BBQ and bar where we bought our outback dinner to grill ourselves. Posted instructions told us how long to grill our outback tucker on the barbie. What was the menu? A mixed grill of kangaroo, emu sausages, crocodile and potatoes! 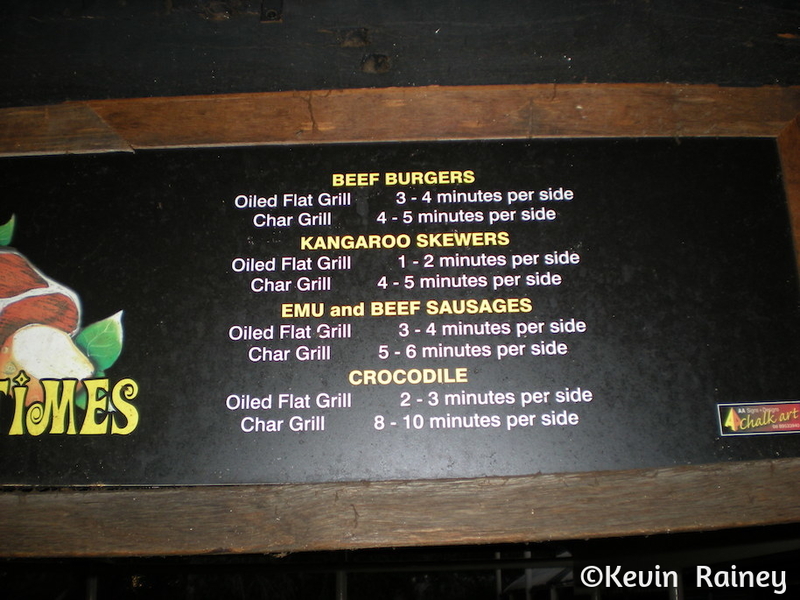 We had already had kangaroo, but the crocodile tasted a bit like alligator back in the southern U.S. The emu sausage tasted not too different from venison sausage. We even threw a few shrimp on the barbie for good measure. To wash it down, a pint of Cooper’s Pale Ale! Not the healthiest of meals, but unforgettable nonetheless. There was also live Aussie country music artists performing in the pavilion-like area. We were wiped out from the last two days of early starts, so we didn’t stay up too much longer. We went back to the room and crashed for the evening.